The Chinese Exclusion Act and Angel Island will introduce students to a broader and more inclusive vision of U.S. immigration history and, ultimately, a better understanding of the world we live in. 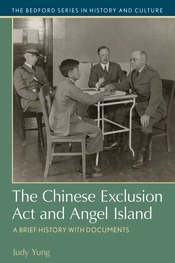 What is uniquely important about this book are the personal stories and viewpoints of proponents and opponents of the Chinese exclusion laws; of Chinese immigrants who posed as “paper sons” and “paper daughters” to evade the exclusion laws; and of immigration officials who held strong convictions about how the immigration laws should be enforced. The introduction provides students with an over-arching historical, socio-economic, and political context by which to understand the compilation of primary documents that follow. For the same reason, each document has its own headnote with background information about the author and comments on its historical significance. Further pedagogical aids include a Chronology, new Questions for Consideration, and a revised Selected Bibliography.